Spring is a time when everyone seems to head outside after a long winter and begin to enjoy the outdoors again. This is a great time to spend an afternoon as a family. One fun tradition to start is by making nesting balls for the birds as they build their nests, and to go on a nature scavenger hunt. Our back yard is home to 5 bird houses. My husband made one with his grandfather and each of our children made one with their grandfather (my husbands dad) a fun family tradition. It has been fun to watch them each year become homes to little bird families. For the ball: Upcycle by using a net bag that onions /produce came in. Any mesh with fairly decent sized openings will work. Birds aren't picky! *Cotton Batting (the soft cotton fibers that are in medicine bottles is perfect (it's not too compacted and pulls apart easily.) 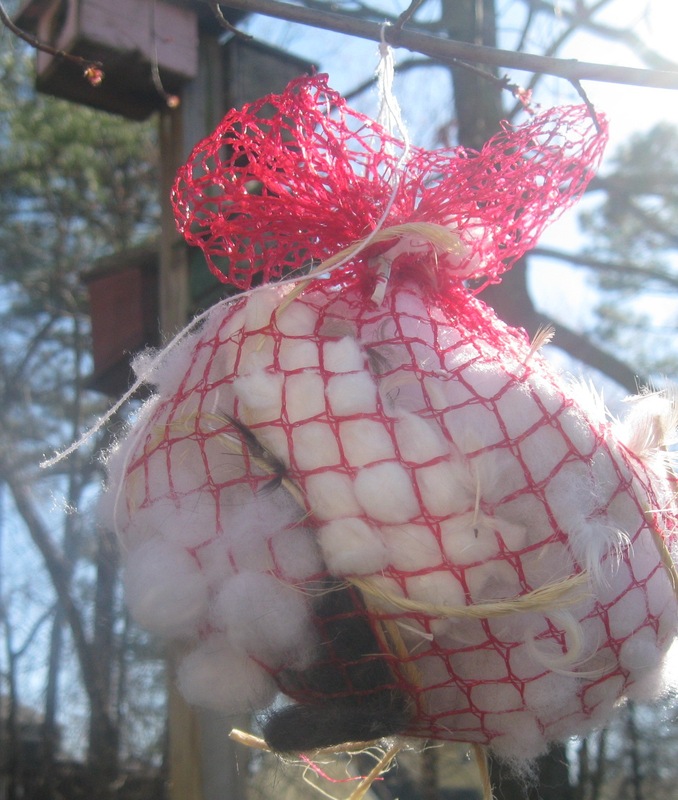 If you do decide to use cotton balls I highly recommend you "unroll them" into a strip and slightly pull the fibers apart so the birds can grab strands of them. *yarn or ribbons if they are cut into strips and are cotton. Any synthetic materials or items: Strips of plastic bags, etc. Fill the net bag with all the gathered items. Pull a bit of the items through the holes so they stick out a bit for the birds to grab a hold of. Gather at the top, tie closed with a string. Go outside and hang from a branch or fence. Pick somewhere the kids can watch from inside the house during the next few weeks. Optional: Cut long grasses, and leaves (such as iris leaves ) and feathers etc. and lay them around the yard for the birds to find and gather also. Take the family on a nature scavenger hunt and picnic! It has tons of lists. They contain pictures for younger children as well as easy to read lists for older children. Many of the lists have an option for downloading to a mobile device in case you just want to grab your i-phone to use it on the hunt. For a nature walk, go to outside hunts, then click on nature hunts. They have tons to choose from (a trip to the zoo- to bird watching). So, the next warm afternoon you are looking to keep your children busy and not in front of a TV have them each make a nesting ball and go for a scavenger hunt walk. Find a place to hang the balls while they are out. Have them look for signs of spring. Nothing is more fun than finding a nest with little pieces of colored yarn that your child put in a nesting ball! Jan's Tip: This would also be a great activity to do along with making bird seed tree hangers too! On your nature walk, pick out pinecones. Come home, smear peanut butter on them and roll them in bird seed. Hang them on trees in your yard! Enjoy starting a new spring tradition in your family! What a lovely idea. I think that my son would love doing something like this! We used to have a dog that shed massive amounts of hair and I used to brush him outside and just leave it there for the birds but didn't think to put it in a bag. We don't have as much available nesting material around these days but I'm sure I can find something! Thanks for sharing! Thank you so much for sharing your post with us on Natural Mothers Network! I would do something similar when my children were younger, very seasonal too! I am really looking forward to hosting the Seasonal Celebration Linky Party #8 going live tomorrow and hope you'll pop over sometime-you're always welcome! I'm glad I read your comment re: Not using dryer lint for bird nesting--I have been saving mine for a couple of months and I had no idea it hardened up outside. Thanks so much for the tip!! I always saved my dryerlint, because my sons loved to take it on campouts for scouting to use as a quick kindling/firestarter for the camp fire.